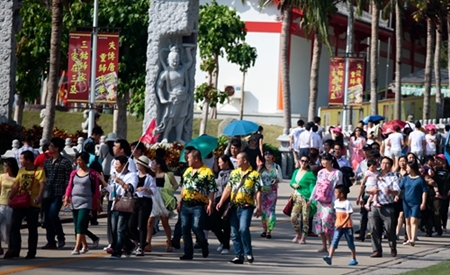 Sanya’s tourism authorities have urged local scenic spots to make a thorough safety inspection and to control the number of tourists in order to maintain good travel order for the upcoming peak travel season. A notice sent out by the Municipal Tourism Authority also set a requirement for working staff at scenic spots to make necessary plans and preparations to evacuate tourists in the event of an accident. At the Nanshan Cultural Tourism Zone, the number of tourists should no more than 100,000 per day, and the most comfortable daily carrying capacity is 60,000 people. As soon as the daily tourist flow reaches 60,000 people, the Nanshan Scenic Spot authorities will start their emergency plan and begin evacuation procedures. The scenic spot will also pay close attention to the tourist numbers and stop selling tickets as soon as the daily tourist flow exceeds 100,000 people.